Considering capacity more broadly, to include institutional and technical elements. 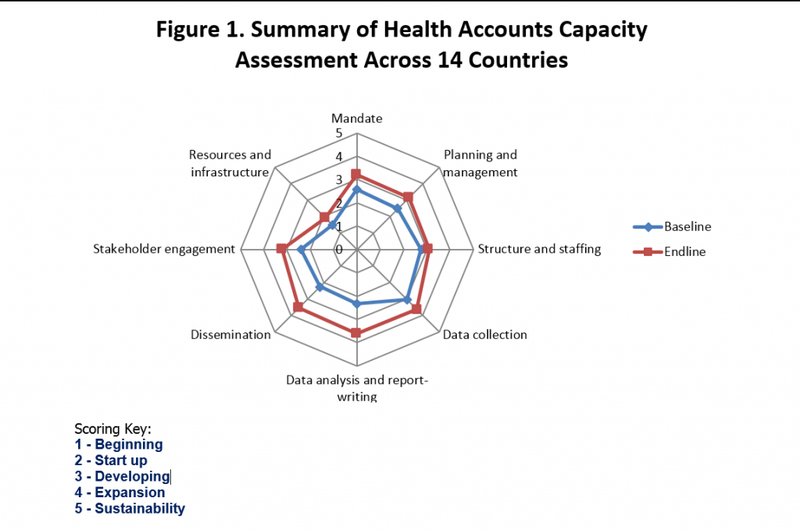 The capacity assessment tool covers the complete set of Health Accounts “competencies” that a country should possess and is builds on TRG’s (HFG partner) extensive capacity building experience and the World Bank’s Health Accounts Institutionalization framework. These competencies include: 1) Mandate; 2) Planning and management; 3) Structure and staffing; 4) Data collection; 5) Data analysis and report writing; 6) Dissemination; 7) Stakeholder engagement; and 8) Resources and infrastructure. For each of the eight competencies, the tool describes specific criteria for scoring each sub-dimension and includes a summary scoring sheet. The tool is less about each country’s absolute score and more about the improvements over time, as a result of HFG’s interventions. Not all of these competencies are ones which HFG can directly support/influence (examples include: mandate, structure and staffing, and resources and infrastructure), but for the sake of comprehensiveness have been included in the tool. The assessment is conducted by a qualified Health Accounts expert providing in-country technical assistance, in consultation with the country HA team. It should be conducted once before beginning technical assistance and then at the end of the Health Accounts exercise. Figure 1 shows that collectively, HFG’s technical assistance has made greatest impact in countries’ capacity in “data analysis and report-writing”, “dissemination”, and “stakeholder engagement”. Monitoring capacity in this way, not only helps to inform the local Health Accounts team of what strong capacity in Health Accounts looks like, but also helps technical assistance providers to tailor their support during subsequent Health Accounts exercises.